Ancestral Discoveries: Was Your Relative a Comic Book Hero? Comic book heroes aren't real, right? Well, they might be if they were Jewish and fought in a World War. 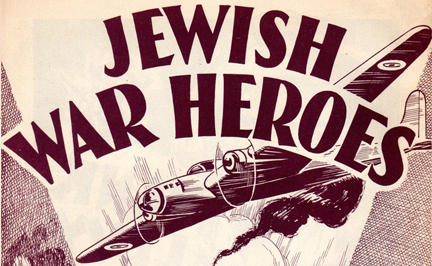 The Canadian Jewish Congress published at least two comic books of Jewish war heroes, and they are available for download. Issue 1 has features on men who fought in World War I and II and general information about WWII. The men were from several countries, including Canada and the U.S. Issue 2 is all about World War II and profiles men from the U.S., U.K., and Netherlands. The scans of the issues aren't perfect. Issue 1 seems to have pages out of order, and Issue 2 has one page upside-down. But the information is great, and they're free (though you do need to register at the site to download, and you have to wait five minutes between downloads). Family names featured are Brenner, Cohen, Fisanovitch, Frijda, Kisch, Levin, Levy, Ross, Shulemson, and Wigram. The Web site has only the two issues and lists both as being in the public domain. I found one site that said there were three issues, but I can't find any evidence of the third issue so far. Tell us if you are related to any of these heroes! Hi, Janice. Our website is the one claiming that three issues were produced. (And thank you for the link to our archive.) We base our claim on a comment posted to our sharing of Issue #1. A reader commented he has photocopies of some of the pages from #3, but "felt they weren’t up to the standards of DCM [Digital Comic Museum] since they were just copies." Perhaps we can track down scans of that missing third issue some day! See what he says! If we find any great scans of #3, we will let you know. Thanks for the information. It can't hurt to try! I have finally seen pages from issue #3! It exists! The names in the issue, which was a "special Canadian edition", are Col. David Arnold Croll, F/O Lou Warren Somers, F/O Max Shvemar, Major Benjamin Dunkelman D.S.O., Flight Lieutenant William Henry Nelson D.F.C., and Petty Officer Max Abramson RCNVR.